Tag line: "The Most Frightening and Fascinating Sea Adventure Ever"
Blue Water, White Death, a 1971 documentary co-directed by Peter Gimbel and James Lipscomb, chronicles the exploits of a team of underwater photographers (Stanton Waterman, Ron & Valerie Taylor, and Gimbel himself) who attempt to do something never done before: capture images of a great white shark in its natural habitat. Joined by researchers and technicians alike, as well as folk singer Tom Chapin (who provides the music for the film), the group will spend five and a half months at sea, beginning their journey with a whaling expedition in South Africa before sailing to Madagascar, Grand Comoro, Ceylon, and Western Australia, all in the hopes of finding the elusive, and very dangerous, great white. Locating a great white shark may have been the ultimate goal of Blue Water, White Death, but it’s the crew’s additional adventures that make it so fascinating. During their time with the whaling fleet in South Africa (a sequence that includes graphic images of whale hunting that some viewers may find difficult to watch), the photographers spent several days filming sharks of various species, which fed on the carcasses that the whalers left behind. At times, hundreds of these predators were swarming around, and, to get a closer look at the feeding frenzy, the photographers left their protective cages to swim among the sharks, a decision that, though quite risky, resulted in a handful of amazing scenes. But this wasn’t the only danger the group would face. While in Grand Comoro, the rough currents nearly pulled one diver out to sea; and in Ceylon, Peter Gimbel suffered a case of the bends, a condition that, if untreated, might lead to paralysis or even death. More than anything, though, Gimbel and company wonder aloud what might happen when they do finally encounter a great white. At the start of Blue Water, White Death, the narrator, Wally King, reminds us just how deadly this creature can be by recounting some real-life cases (according to King, a great white once swallowed a man whole in the waters of La Jolla, California, while another victim was bitten in half off the coast of Western Australia). Most of the photographers had never seen a great white shark up-close, and had no idea what to expect. Yet, despite the potential threat, they couldn’t wait to find one. For some (especially Peter Gimbel), locating a great white even became an obsession. The movie has its quiet moments as well; Ron & Valerie Taylor frolic with seals in Australia, and we’re treated to some beautiful underwater shots of sea turtles, eels, and barracudas. 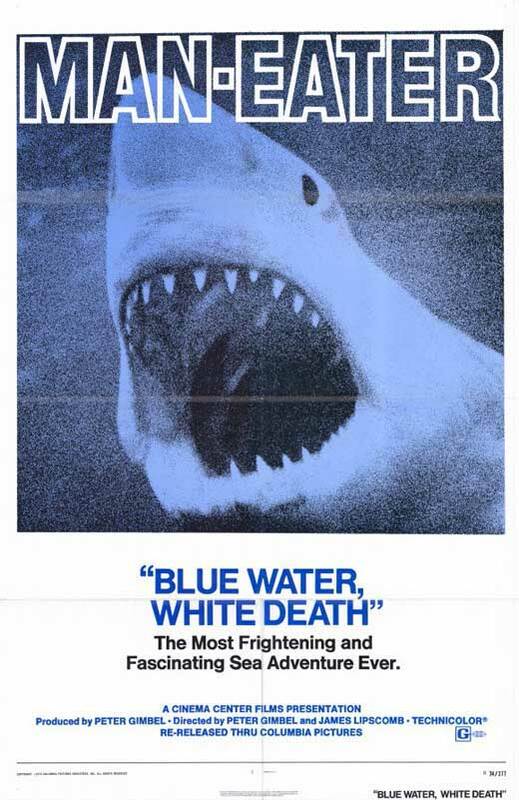 But for most of its runtime, Blue Water, White Death is as much a thrilling adventure as it is a documentary, and, like those who took part in the journey, you will be swept up in the excitement of it all.